Teach your children how to deal with disappointment by setting a good example. Dealing with disappointment is one of the hard things that comes from life. 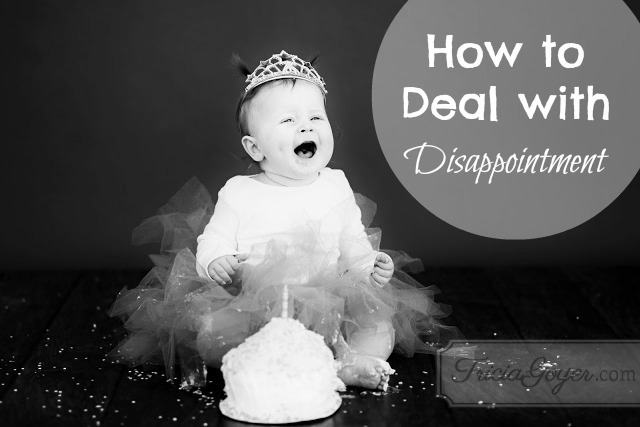 Seeing our kids deal with disappointment is even harder. Yet we know that in every person’s life there will be struggles, and the older our kids get, the bigger the problems. Ugh! So how do we handle unexpected problems? During our personal setbacks, we voice the problem with our kids, and we ask them to pray with us. We talk about solutions (finding wisdom from God’s Word), and we look positively at steps we can take. We also try to prepare our kids ahead of time for the challenges they will have in life. When it comes to talking about our time on this earth, we remind our kids that things will not be perfect—ever. There is no such thing as reaching perfection on earth. Rather, we tell them it’s what’s on the inside that counts. It’s character and honor and resilience that will pull each of them through. It’s having faith in God and moving forward even when you want to give up. Another thing I do is talk to my kids about “scripting” their lives. They are the screenwriters of their own life stories. Instead of getting caught up in the drama of everyday circumstances, I’ve encouraged them to think through their emotions and responses BEFORE those things happen. For example, if Leslie’s friend accuses her of something, how should she respond? By thinking ahead of this type of conflict and Leslie’s responses, it will help her know how to deal with the situation, instead of being caught off guard–and allowing the emotions to flow. Or what if Nathan doesn’t do well in the science fair? What’s next? I try to talk through different scenarios to help him prepare mentally for what is to come. This makes adversity easier to deal with when the situation arises. Disappointment will come, but a positive attitude, trust in God, and a focus on others will always pull us through. Don’t forget! Chasing Mona Lisa is free! Today’s the last day to pick up a copy for that price!